The pace at which the operational needs of multinational organizations are developing shows no sign of slowing as 2019 begins. Luckily, technology is staying a step ahead, even as business leaders are still coming to understand what’s needed to remain competitive today, as well as what their companies will need and want in the years ahead. If the widespread changes and challenges of 2018 taught us anything, it’s the value of adaptability, particularly when it comes to essential service functions like payroll and HR. Data security is paramount, and technology is providing the means for staying both current and compliant. 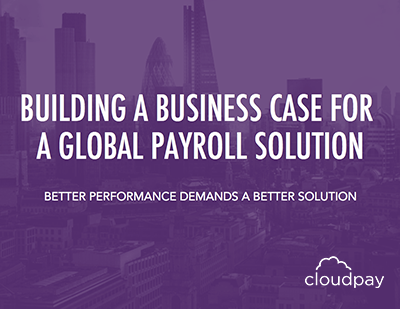 We’ve seen that cloud-based solutions are the way forward, yet a recent report from NelsonHall found that only 40% of organizations surveyed have an integrated HR and payroll solution in place. Improving payroll performance and outcomes in 2019 requires full consideration of the technology that’s available—and the understanding that change will continue at this accelerated pace alongside the digitization of global business and the way we work. As such, looking ahead means determining exactly where you are and what’s needed now to ensure your adaptable future. Payroll has long relied on large, complex, data-laden Excel files, moved to and fro through file transfer servers. Critical payroll data is manually input, updated, and corrected in these files, then transferred again to be entered into the payroll system. That’s where the real trouble begins: because these files are treated as a single data point, the legacy payroll systems take in every line as if it’s one large piece of data. So when an error is found in the thousandth line, the entire file must be manually updated and re-entered into the system as a new complete dataset. And when another error is found in the updated file, the cycle repeats. There’s a lot of room in that process for unintentional errors and unforeseen delays, all while payroll teams are working against hard deadlines. But for years, it was the best way of ensuring that the most complete, up-to-date payroll data was in the system and ready for processing. Thankfully, that’s no longer the case. Today’s leading payroll solutions leverage the latest technology to ensure better data management and outcomes. Cloud-based data, smart automation, and asynchronous syncing create a workflow that maximizes accuracy and security, while decreasing the amount of time required for processing payroll. The latest cloud-based systems maintain a working database that can be accessed and amended as needed, without the need to transfer files. Solutions equipped with asynchronous syncing enable teams to add or update individual data points within that master database, leaving the correct data untouched and thereby eliminating the chance for unintentional errors. Robotic automation modules can automatically validate all data according to parameters set by the payroll teams according to their needs, verifying in moments that the complete data record is ready for processing. 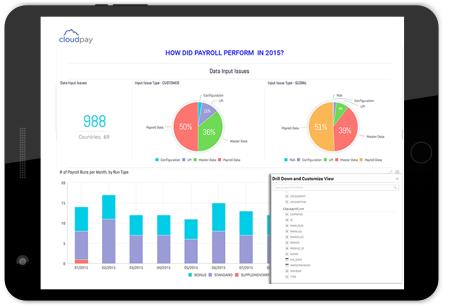 Beyond improving workflows and cycle times within payroll, these same technology advances can benefit related functions and the organization as a whole when the data-driven payroll solution is integrated with closely related functions like HR or Finance. 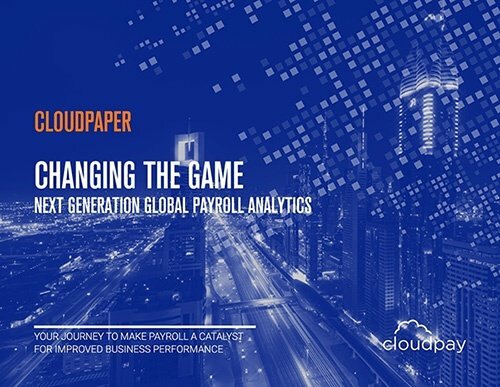 Recent years have seen significant advances in global, cloud-based HCM and ERP systems, and last year’s updates by global payroll SaaS providers have brought payroll into step. A critical move in any global payroll or HR transformation today is to integrate those systems so that data can be exchanged seamlessly and in real time between the two functions. Rather than wait for a file transfer from HR, the required data becomes available directly in the payroll system. And after processing, payroll outputs and even payslips are made available directly in the organisation’s HCM. Depending on the size of the company and the complexity of their payroll, integration can mean significant time and cost savings, with the added benefits of increased data protection and visibility. These capabilities are already in play in organizations around the world, meaning further developments will use cloud-based, automated, integrated data records as their starting point. The benefit of that reality is that global companies gain considerably from implementing these future-ready solutions, notably in necessary areas like data protection and compliance. The key is to approach the idea of transforming your payroll or HR with the integrated end in mind.